is the small but mighty IRXP-5001 Thermal Imaging Infrared Security Camera. What’s so special about this guy is that he’s ONE OF A KIND. This is a versatile custom made thermal imaging system that was made solely for our lab and testing. It comes in a kit with a super-sturdy hard case for traveling/storage. You can use this affordable thermal imaging camera mounted on a tripod (comes with a lower tripod mount) for thermal microscopy, lab analysis or process control for factory automation. Mount it on a building, or even use it hand held for on the go surveillance footage in a police cruiser for evidence purposes (it comes with a 12 V DC cigarette lighter adapter). 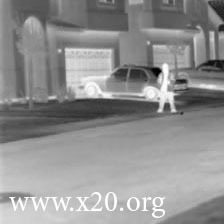 It films thermal video and captures high resolution thermal images in both black hot & white hot modes in 320×240 microbolometer resolution. Below are some sample thermal infrared images in white hot and black hot taken with the IRXP-5001. It makes a fantastic infrared security camera that will identify the creeps even at night! We’re pricing it at an extremely low $2,900 so this model won’t last long. If you’d like to buy this low cost infrared camera, please click here and get it now at an unbelievable discount! If you want to see what other custom thermal imaging products or thermal scopes we can offer you, please visit out main site at www.x20.org. DISCLAIMER: All wholesale items are sold as is and we do not offer refunds or exchanges. Please be aware there are export restrictions on SPI thermal imaging solutions. Read more about our terms & conditions. If you have any export questions or would like to know more about products we can export, please contact us here.